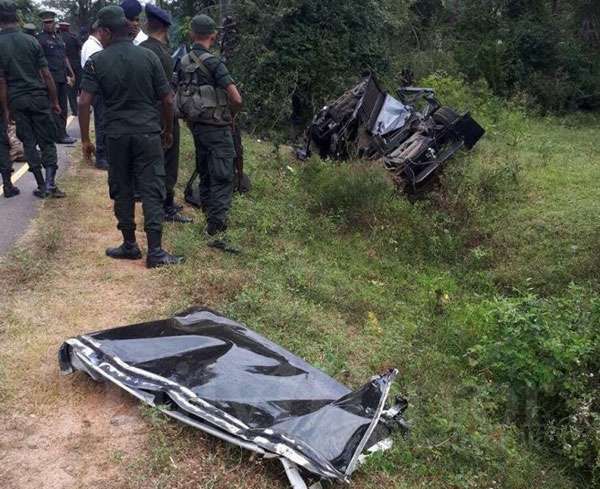 A major and a corporal were killed while four others were injured in an accident at Oddusuddan in Mullaitivu this afternoon, the Army said. Police said the army jeep, in which the army personnel were travelling in, skidded off the road near the 29th mile post and crashed into a tree at around 1.30 p.m. 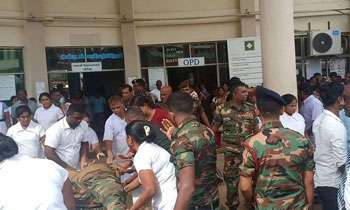 The injured were admitted to the Vavuniya Hospital and the corporal and the major were pronounced dead on admission to the hospital. Hi now MR has a topic to talk for months. When you tried to fly these things can happen. When we fail to deal with justice the supreme judge take over the case. He may be a active member of genocide. Is this an engineered accident? Ambulances, vehicles from various defence establishments drive as if they own the roads. This has to be stopped. Speed kills. The forces think that they have the freedom of the road anywhere and anytime. The police should catch speed breakers whether politicians or forces. Even dropping children to school they fly. Keep tooting and flashing lights. When will this ever stop? Why do you say administrative duty? Are you shy to say they were returning after guarding President on his visit to north?